Note: This is the bound book only and does not include access to the Enhanced Pearson eText. To order the Enhanced Pearson eText packaged with a bound book, use ISBN 0134300742. Long considered the standard of excellence—the best introduction and guide to the practice of family therapy available—this accessible resource explores the rich history and contemporary practice of the entire field. 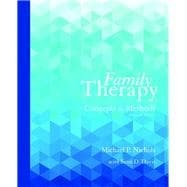 Thorough, thoughtful, fair, and balanced, Family Therapy by Michael P. Nichols presents ideas and techniques that give readers a clear focus on clinical practice. While exploring the history, the classic schools, and the latest developments, this new edition puts an increased, pragmatic focus on clinical practice, which includes discussions of the author’s observations of actual sessions with leading practitioners, as well as the best case studies of several invited master therapists. Included are video links, interactive chapter quizzes, new case studies, a new section on the impact of the Affordable Care Act, and many more content changes that bring the reader up to date on the latest and most critical issues in the field of family therapy today. The Enhanced Pearson eText features embedded videos and assessments. Michael P. Nichols is a professor at the College of William and Mary. Dr. Nichols received his B.A. from the University of Wisconsin, and his Ph.D. from the University of Rochester. He teaches and practices family therapy, and is the author of numerous journal articles and books, including Inside Family Therapy, The Lost Art of Listening, Stop Arguing with Your Kids, and Essentials of Family Therapy. He is co-author, along with Salvador Minuchin and Wai-Yung Lee, of the newly published Assessing Families and Couples: From Symptom to System.